I wasn’t into prom as a teenager, but I do enjoy themed gigs and excuses to dress up. (Or, real talk, excuses to watch people more creative than I dress up while I slum it in jeans and a hoodie.) 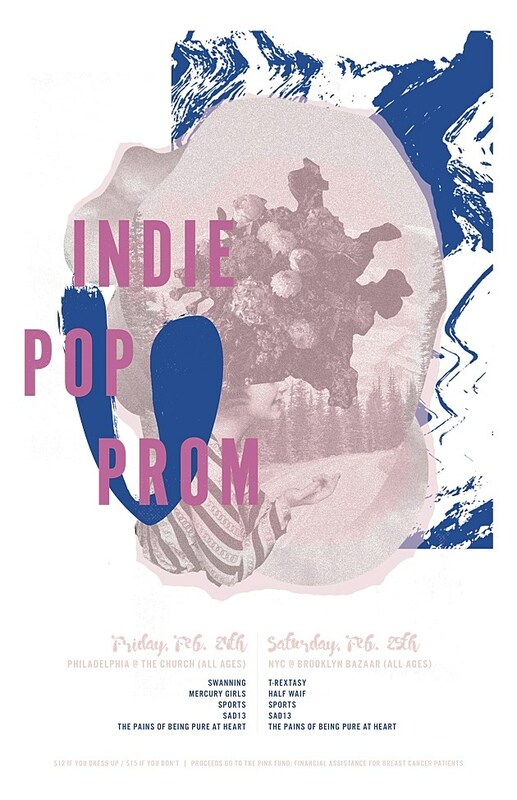 In any case, the Indie Pop Prom that R5 Productions just announced today seems like exactly that. The all-ages gig has been happening for a few years (five, to be precise) in NY, and has a Philly satellite this year that takes place in the basement of the First Unitarian Church on Friday, February 24th. And with a stacked lineup of favorites from the DIY underground, it’ll be the perfect post-Valentine’s hang for all the lonelyhearts of the Philly house show scene. It’s an almost entirely-local lineup too, especially so if you consider that Kip Berman, leader of revered jangle-popsters The Pains of Being Pure at Heart, grew up in the Philly region and was reared on the local punk scene before moving to Brooklyn and launching the band in 2007. The Pains are headlining, and if memory serves, it’s their first Philly gig since 2014, when they played Johnny Brenda’s in support of that year’s Days of Abandon. Here’s hoping a new record is in the cards as well. Co-headlining is Sad13, the solo project of Sadie Dupuis of Speedy Ortiz, who released the excellent LP Slugger last year. With the record, the Massacussets native relocated to West Philly. Read her thoughts on the scene here, in her High Key Portrait Series profile. Local favorites Mercury Girls are also on the bill along with Philly’s Swanning, the project of Radiator Hospital guitarist Cynthia Schemmer. Rounding the gig out is Sports, an Ohio-founded four-piece that relocated to Philly and recorded with Kyle Gilbride of Wherever Audio and Swearin’ fame. The all-ages show also benefits the Pink Fund, a nonprofit providing financial assistance to breast cancer patients (more info here). Tickets to the all-ages show go on sale Friday, January 6th at 10 a.m., more information can be found at the XPN Concert Calendar. Check the flyer below with more on the Brooklyn edition of the Prom as well.